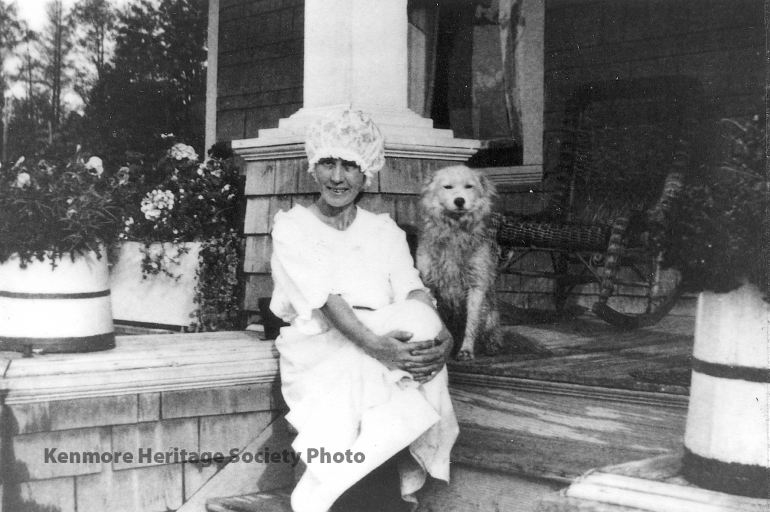 Myrtle Niemeyer, wife of Ed Niemeyer, and the family pooch relax on the front porch of their home in Kenmore. According to family history, the young Renton-born Ed Niemeyer had returned from the Alaska gold rush and was running gambling games in the basement of the Old Northern Hotel on First Avenue in Seattle. That’s when he met Myrtle King, who managed a dry-goods store in Snohomish. Ed proposed marriage, but was refused. “I’ll not marry a gambling man,” Myrtle is said to have told him. So Ed quit gambling and bought a restaurant in Snohomish. He and Myrtle were married in June, 1903 and later moved with their growing family to Kenmore where Ed started a logging operation. At the time, standing timber stretched from Lake Washington to Everett. Ed and Myrtle built one of the first homes on Bothell Way, in 1909-10, on two lands purchased in 1905 for $25 each. The Family’s home site is occupied today by Bethany Baptist Church.